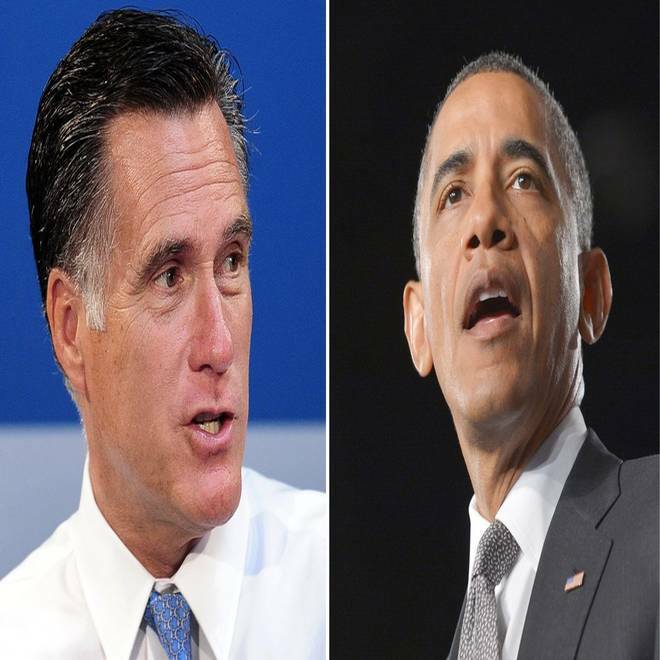 Republican presidential candidate Mitt Romney and President Barack Obama have answered 14 questions on science and technology issues. President Barack Obama and his GOP challenger, Mitt Romney, have sent in their answers to the political campaign's highest-profile science quiz — the 14 questions on science and technology issues posed by Science Debate 2012 — and Romney's answer to the climate question is already stirring up some buzz. The answers distill the candidates' stands on topics ranging from ocean health, to the federal support for innovative research, to the process for developing science policy, to the proper way to plan for a potential pandemic. The territory covered by the questions has shifted somewhat since 2008: For example, stem cell research appears to have become a non-issue, while Internet policy gets its own question this time around. But it's Romney's response to the question about climate change that has drawn the most attention. For months, Romney has been criticized for going back and forth on the issue of what to do about global warming. He generally acknowledges that greenhouse-gas emissions have had an effect on climate, but he's backed away from policy responses such as carbon cap-and-trade markets. Climate change: The Earth’s climate is changing and there is concern about the potentially adverse effects of these changes on life on the planet. What is your position on cap-and-trade, carbon taxes, and other policies proposed to address global climate change — and what steps can we take to improve our ability to tackle challenges like climate change that cross national boundaries? Mitt Romney: "I am not a scientist myself, but my best assessment of the data is that the world is getting warmer, that human activity contributes to that warming, and that policymakers should therefore consider the risk of negative consequences. However, there remains a lack of scientific consensus on the issue — on the extent of the warming, the extent of the human contribution, and the severity of the risk — and I believe we must support continued debate and investigation within the scientific community. "Ultimately, the science is an input to the public policy decision; it does not dictate a particular policy response. President Obama has taken the view that if global warming is occurring, the American response must be to slash carbon dioxide emissions by imposing enormous costs on the U.S. economy. First he tried a massive cap-and-trade bill that would have devastated U.S. industry. When that approach was rejected by Congress, he declared his intention to pursue the same course on his own and proceeded through his EPA to impose rules that will bankrupt the coal industry. "Nowhere along the way has the president indicated what actual results his approach would achieve — and with good reason. The reality is that the problem is called Global Warming, not America Warming. China long ago passed America as the leading emitter of greenhouse gases. Developed world emissions have leveled off while developing world emissions continue to grow rapidly, and developing nations have no interest in accepting economic constraints to change that dynamic. In this context, the primary effect of unilateral action by the U.S. to impose costs on its own emissions will be to shift industrial activity overseas to nations whose industrial processes are more emissions-intensive and less environmentally friendly. That result may make environmentalists feel better, but it will not better the environment. "So I oppose steps like a carbon tax or a cap-and-trade system that would handicap the American economy and drive manufacturing jobs away, all without actually addressing the underlying problem. Economic growth and technological innovation, not economy-suppressing regulation, is the key to environmental protection in the long run. So I believe we should pursue what I call a 'No Regrets' policy — steps that will lead to lower emissions, but that will benefit America regardless of whether the risks of global warming materialize and regardless of whether other nations take effective action. "For instance, I support robust government funding for research on efficient, low-emissions technologies that will maintain American leadership in emerging industries. And I believe the federal government must significantly streamline the regulatory framework for the deployment of new energy technologies, including a new wave of investment in nuclear power. These steps will strengthen American industry, reduce greenhouse gas emissions, and produce the economically-attractive technologies that developing nations must have access to if they are to achieve the reductions in their own emissions that will be necessary to address what is a global issue." Barack Obama: "Climate change is the one of the biggest issues of this generation, and we have to meet this challenge by driving smart policies that lead to greater growth in clean energy generation and result in a range of economic and social benefits. Since taking office I have established historic standards limiting greenhouse gas emissions from our vehicles for the first time in history. My administration has made unprecedented investments in clean energy, proposed the first-ever carbon pollution limits for new fossil-fuel-fired power plants and reduced carbon emissions within the federal government. Since I took office, the U.S. is importing an average of 3 million fewer barrels of oil every day, and our dependence on foreign oil is at a 20-year low. We are also showing international leadership on climate change, reaching historic agreements to set emission limits in unison with all major developed and developing nations. There is still more to be done to address this global problem. I will continue efforts to reduce our dependence on oil and lower our greenhouse gas emissions while creating an economy built to last." Romney devotes a lot more space on his answer, but he has a more complex case to make — a case that accepts the idea that industrial activity is changing the climate, but that the right kind of industrial activity can solve the problem. "This is what I call the technology trap, where clean energy technology is used to delay action, rather than to foster action, on climate change," Joe Romm writes on the Climate Progress blog, which has been reliably critical of Romney in the past. What do you think? Feel free to register your opinion in our admitted unscientific online poll, as well as in your comments below. And be sure to take a look at all 14 questions and answers, either on the Science Debate website or at Scientific American. Extra credit: The other question that was close to my heart was the one on space policy: Obama sticks to his game plan for sending humans to an asteroid by 2025 and to Mars in the 2030s — that is, long after the end of his second term. Meanwhile, Romney complains that America's leadership in space is "eroding" and vows to "bring together all the stakeholders" in the space effort to develop a fresh plan to rebuild NASA. He also says "a strong and successful NASA does not require more funding, it needs clearer priorities." Reminder: NASA receives about 0.5 percent of the federal budget (less than $18 billion in 2012), and some outside observers (including astrophysicist Neil DeGrasse Tyson) say that funding level should be doubled.